Making yourself a priority is truly a life-changing choice. We are taught to believe that if we put ourselves first, others will be left behind. Is that really the case? This reality hit home for me over three years ago. As a very proud mother of twin girls, making the choice to make me also a priority took strength and commitment. It challenged the notion that a good mother leaves her needs behind those of her children. For months I had been interested in a specific leadership class that I knew would change my life in many ways. At the time, my daughters were on the high school running team. Each time I planned in advanced to go to these classes, my girls exceeded their running time goals and were invited to Regional Championships and State Championships. They were being recognized for their accomplishments. I was so proud of the life they were creating for themselves. Instead of attending the class, I cancelled twice to make sure I could be in the crowd cheering for them during their mid-distance and long distance runs. It finally hit me. If I waited for them to have a weekend free of competitive running, I might never make it to the class. So, for the third time, I signed up for this incredible leadership class and made a promise to myself, “No matter what happens in my life or my daughters’ lives, I am going to make it to this class.” Yes, I felt a little guilty. And yes, at first I wasn’t sure if I had made the right decision. Yet, as I had suspected, the class exceeded my expectations and I came home excited, empowered, and able to navigate my life and business more joyful and creative than ever before. I realized what a ripple effect my choice had on everyone around me. My husband and his business; my daughters and their school and running; my other family members, and my clients. Interestingly, it even had a positive effect on the strangers I met in the street. Everything changed dynamically. I was able to look at situations differently, open my eyes to possibilities I had never considered in my business and personally, and overall my energy level had changed. Even though all the changes were not verbal, the energy I had after the class had so much joy and freedom in it, those around me, including strangers, were eager to ask me questions. More joy, that is what life is about for me. What about you? So I’d like to invite you to a different possibility. 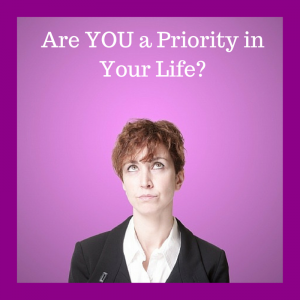 Is today the day that you actually make you a priority in your life? This does not mean pretending that those around you are not priorities when they are, it means realizing that you too, are a priority. What if you tried this right now? Will you include yourself and your needs in the priorities? What would you choose if you were putting this into action? What are some of those goals you have, the ones on your ever-untouched to-do list? What would these choices be for you? What are five choices you could make today that would contribute to your future? When you start to make yourself a priority the ripples will be enjoyed by everyone in your life. It is important to care for everyone and look after your loved ones, but everyone includes you. Your company will grow as a result of you growing and you acknowledging you as a priority in your life. So never be afraid to make yourself a priority. If you do, how many people will benefit?